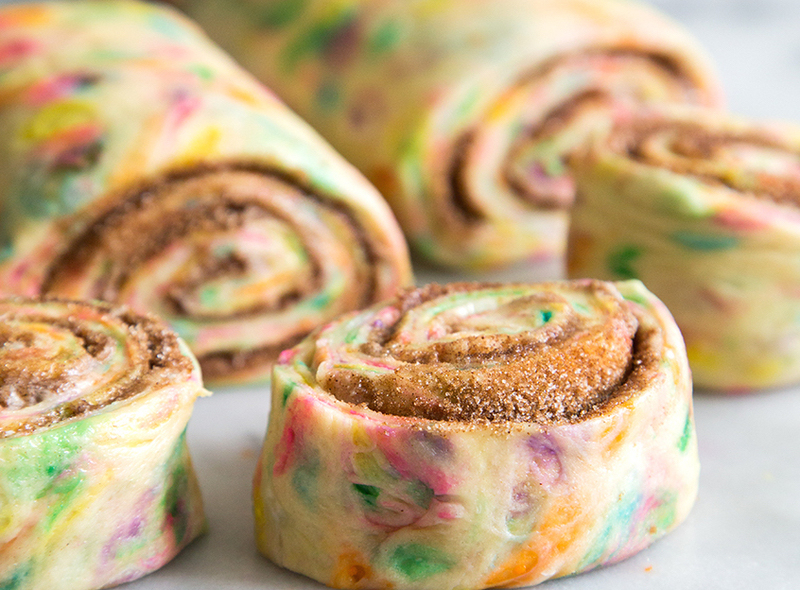 With the addition of colorful sprinkles and amaretti, these classic cinnamon rolls are elevated to a whole new level! Big, fluffy, soft and absolutely delicious Cinnamon Rolls with a Twintastico Italian Twist. In the bowl of a standing mixer fitted with a dough hook, mix the egg, yeast, milk, salt, sugar, vanilla and melted butter. Now add the flour and turn the speed up to medium and let it mix for about 5 to 7 minutes or until you have a smooth dough. Add confetti sprinkles and mix until evenly distributed in the dough. Oil a large bowl with some vegetable oil and set aside. Take the dough out of the mixer and pull it together with your hands to form a ball. Place it in the oiled bowl and oil the top of the dough with a little vegetable oil. Cover with plastic wrap and place it in a warm spot to rise for about 2 hours. For the filling – In a small bowl, mix together the sugars, amaretti biscuit and cinnamon for the filling, set aside. When doubled in size, punch the dough down and roll it out onto a floured surface into a 15×9 inch rectangle. Spread the soft butter over the top and sprinkle evenly over the sugar, cinnamon and amaretti mixture. Starting from one of the long ends, tightly roll the dough into a log. Cut into 14 to 16 slices (make sure they are even) and place them cut side down in a well buttered 9×13 baking pan. Cover with plastic wrap and let put them back into a warm spot to rise for another 1 ½ hours. Meanwhile preheat your oven to 350F. While the cinnamon rolls cool for a few minutes make the glaze. Mix all the ingredients of the glaze in a bowl until smooth and thickened. Spread over the warm cinnamon rolls and sprinkle on top the confetti sprinkles and enjoy!